*Interested in being a DWAFCEA annual sponsor? Check out our Sponsorship Opportunities page. Limited seating, capacity 120 attendees, so sign up soon! 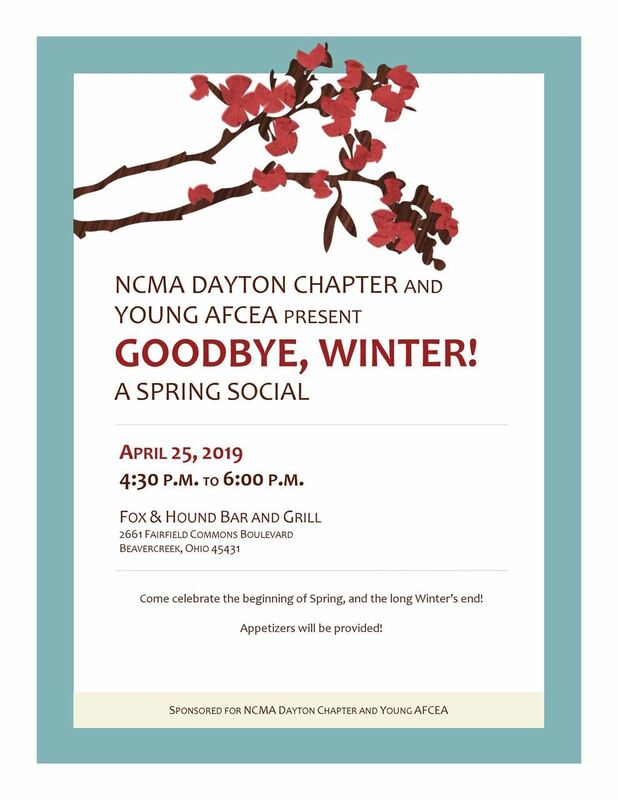 Come out to celebrate Spring, good weather, leaves on trees, longer days, and good friends with the NCMA/Young AFCEAN Spring Social! Event is free to attend and all are invited - please invite guests and co-workers to join. RSVP REQUIRED: BY 5PM ON FRIDAY, May 10, 2019 - ON OUR ONLINE SYSTEM **ONLINE PRE-REGISTRATION IS STRONGLY ENCOURAGED TO HELP THE AFCEA CHAPTER AND HGI FACILITATE AND ORGANIZE THE LUNCHEONS TO MEET THE NEEDS OF ALL GUESTS. CORPORATE AFCEA TABLE RESERVATIONS SHOULD ALSO BE SUBMITTED BY 5PM ON FRIDAY, MAY 10, 2019. Please complete and submit your registration by the assigned deadline in order to guarantee your corporate table. Please also include the names of your corporate attendees upon submission of your request. In keeping with tradition, the Dayton-Wright AFCEA and Wright Brothers LOA team will be hosting the Daniel J. Curtis Memorial Golf Tournament on 3 Jun 2019, the day before the 4th Annual Air Force Logistics IT Summit. This event is intended to enhance the dialog between USAF logistics leaders and government/industry community on the future-state information technology needs of the Department. * Proper attire includes: golf shirts with collar, golf sweaters, sweatshirts, golf slacks, proper length shorts, golf shoes or soft soled shoes. Proper golf attire does not include: T-shirts, tank tops, mesh shirts, denim jeans, coach’s shorts, swim wear, collarless shirts and sweatpants. Metal spikes are not permitted. Huge, two-day event at Austin Landing with food trucks, beer, skydiving, concerts, and more! Looking for volunteers to help sell entrance tickets, beer, and perform other duties during this fundraising event. Artic Clam and The Menus performing Friday night. 33 People and Bruce in the USA performing Saturday night. Please register if you are interested in volunteering with the YAC crew, and we will be in touch with more details. Open to anyone to volunteer! If you can't volunteer, consider attending to support a great cause! Fun time guaranteed. 18 Jan 2018 AFCEA January 2018 Luncheon - Lt. Gen. Robert D. McMurry, Jr.